Sequels are always dicey propositions, because they often times carry heightened expectations from earlier games that did some things well, but had room for improvement. The Golf Club 2 is one of those examples of a follow-up title having been done right. There are still areas that could use refinement, but by and large what we have is a game that is an improvement over its predecessor in just about every way. Related reading: Our review of the first The Golf Club. I enjoyed the original title The Golf Club quite a bit. It was a challenging title that did a fantastic job of representing the sport faithfully while offering fans of the title a great deal to do through its editing and community options. Still, for all of the things that The Golf Club did right, there were some problems upon release as well. The editor was sometimes sluggish, and this was especially true with the early release on Xbox One. The visuals were pretty at a distance but struggled up close. Additionally, it was lacking in any kind of career mode - a must for a lot of sports fans such as myself. So while the title flashed plenty of potential, it left me wanting more. Fast forward to Maximum Games' recently released sequel, and with it a series of incremental improvements that show the team is moving in the right direction, but they are not there yet. For one, and probably the most notable difference to me, was the adjustment in how the actual club is swing. I recall playing golf games by EA on older consoles like the Sega Genesis and newer, and it was a series of menus and timed button presses that tried to simulate the action, but it never really captured the flow and movement of the game. Over the years numerous golf games have played with and tweaked the hitting style, but The Golf Club 2 has one of the best systems. Instead of a bunch of menus to navigate, it is all about using the stick to swing backwards and then down. Not only is the game measuring your ability to swing in a straight line, but it also measures how far back you are swinging as an input to your power. 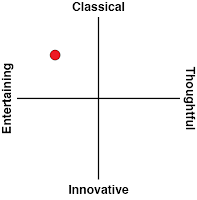 Additionally, this year's version adds tempo to the considerations. Unsurprisingly, this particular addition is pretty awesome, as it helps you to develop a cadence with both the back swing and the downward swing, and adds another layer to the gameplay mechanic you used most often. The sound effects are simple, with some commentary over the top of what you are doing, and the sound of a club whacking against the ball, or the sound of your golf ball striking the grassy surface with a dull thud. 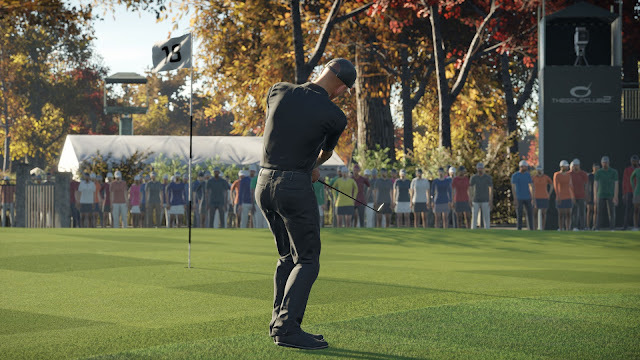 It fits the ambience of the sport nicely, as do the visuals that allow for some nice horizons, plenty of different kinds of trees and slopes that impact the actual gameplay as you have to consider everything from angles to how fast the greens roll or how firm the fairways are. The one area that the visuals do not hold up as well is in the sort of odd scaling that happens as you get closer to something. What I mean by that, is at a distance there is a haziness, while up close they gain considerable clarity. While this should be a more gradual effect, there are times you can almost see a clear line as the ball rolls forward and there is a bit of an odd 'snap' to the gently swaying shadows of the trees as they suddenly come more sharply into focus. It is not a big deal, but for a game that is so heavily focused on immersion, it is a somewhat aesthetic breaking graphical tick all the same. One other area where the engine does not seem fully optimised is the framerate, and while I hate to harp on visuals, this issue has an actual gameplay impact. It does not happen all of the time, but when it does, it can be frustrating. When the game stutters during your backswing, it can completely hose your timing and make for an ill-fated put or drive that is not the fault of the player, but the system. 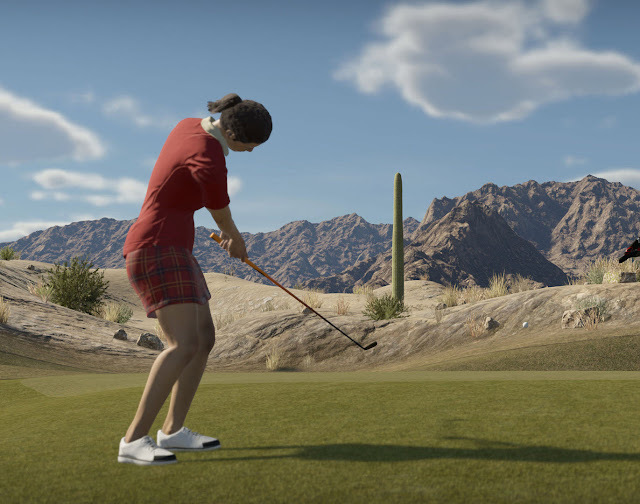 When the original Golf Club released, there were some performance concerns as well, and these did get improved, so I am holding out hope that they will fix this issue as it is probably one of the most frustrating ones for me. Since I was just referencing the editor, let's talk about one of this title's greatest strengths. The Golf Club 2 ships with a handful of courses designed by the developers, and these are all fantastic examples of how one can create courses with different kinds of features such as semi-soft fairways or blazingly fast and dry greens. 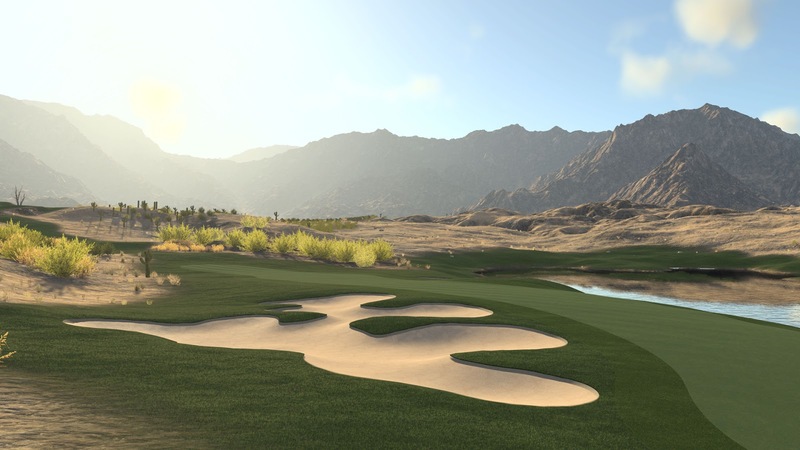 They do a nice job of providing variety right out of the gates, but where The Golf Club series really shines is the ability for you to make your own courses and upload them so that others can play on them, rate them, favourite them and more. These types of editing tools are powerful, relatively easy to learn and give this title a great deal of life. Where the original title came up a bit short was the lack of a career mode. I'm happy to say that The Golf Club 2 has added one, though it's currently a little thin. Of course, they want this to be a game about skill, so you don't really have character stats baked in the way some older golfing titles did, but I admit that sense of progress through the ranks of the golfing world were fun and kept me coming back for more. Here it is really all about just getting better and earning more money. More money allows you to improve your 'society' (basically, the career mode) level, or unlock new articles of clothing, but that is about it. It is fun, but still rather shallow. Hopefully the team can find more ways to make career mode deeper with some additional carrots to dangle in terms of progression, because right now the offering needs more. In general, I like what The Golf Club 2 has to offer. 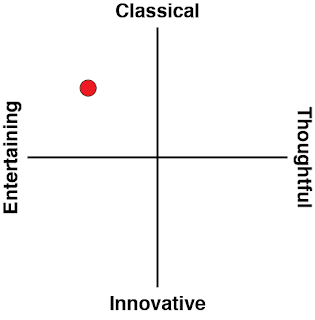 It is a really solid representation of the sport both in terms of mechanics and the overall aesthetics. Because of the course editor, you have a plethora of options you can use to create the course of your dreams, or just play those made by other people. The possibilities are limitless. However, some technical issues still linger and the career mode could use some additional depth as The Golf Club takes some small steps in the right direction.